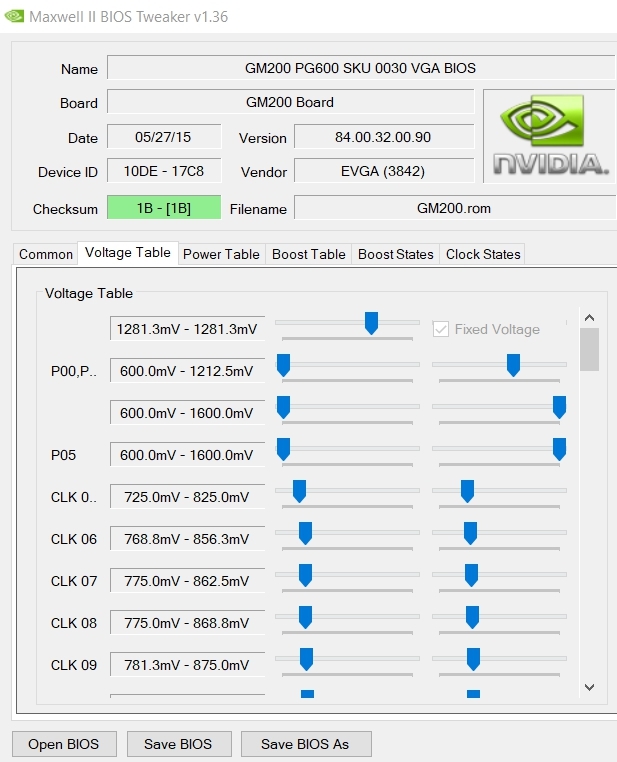 Discussion in 'Videocards - NVIDIA GeForce Drivers Section' started by maxio, Oct 9, 2017. Working on my side; sorry to say your cards are different, not compatible or simply pebkac. Try this, if it's not working, it's definitely your setup or pebkac. And if that's the case, sorry buddy you are SOL. 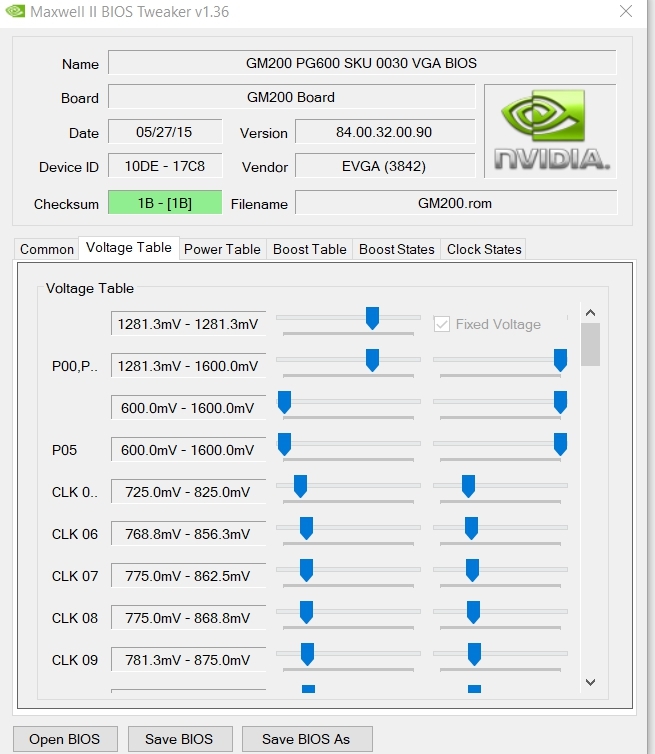 May I kindly ask for an EVGA SC ACX 2.0+ BIOS running 1455 MHz Core at 1.25 V? Awesome, thank you so much! Working great! Sorry I took so long, didn't read it until today. Done and it aint working. Voltage at 3D seems to be stuck at ~1.055-1.068. If i run the cards at 1300MHz the voltage seems to run at 1.068 without problems. Well it's only happening for you. I've had a 980ti SLI setup and it always worked. But perhaps newer drivers are changing something regarding SLI. I suggest you try one card at a time. But anyways good luck on finding a solution. Kinda hard with a custom waterloop. Take a look around the web, it seems to be several others with same problem. I'm not referring to the issue of code 43. That's a well known issue. I'm talking about the fact that it isn't working for you. Among the other dozens of people, it's only you. But, i don't recall anyone else having SLI so it may be other driver issues. And again. Take a look around you and not only on Guru3D. There's several of problems with the new drivers. Sounds like specific driver issues with SLI. Don't have a 2nd 980ti to test anymore. Nevertheless, you may try this one. 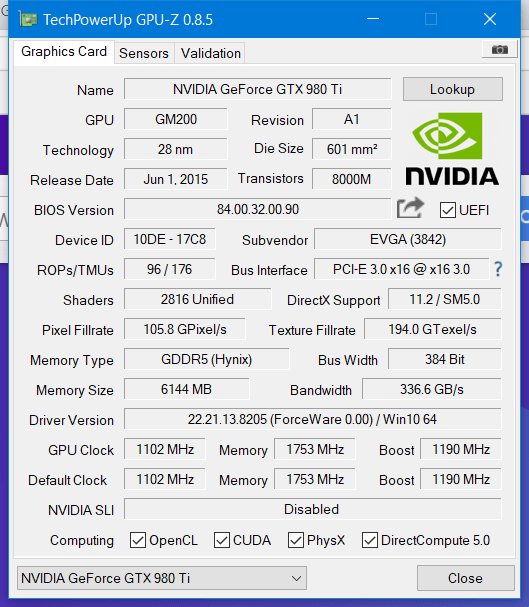 I changed everything manually via hexedit and I also updated the GOP driver within the vbios. Just wanted to say I'd been suffering from this for a while and assumed it was down to a bad driver. Thankfully using this thread I've resolved the issue with my modded bioses which was down to me messing with the P0,P2 states. Cheers guys! My rig is up and running again I found my original vbios and manually edited it to look like an example you provided for someone else to flash. Works better than ever honestly. Lot's of different vbios with p0, p2 states edited out there. Hi Guys, I have the same problem as OP. So I understand the fix is basically to update the bios version in order to show the additional hidden voltage sliders above P00, P02 slider so I can adjust these as required. I am currently on the old bios version 84.00.32.00.01 so these sliders are not shown (and i was running P00, P02 state locked to 1.25v like OP before which now causes same problem due to incompatibility with latest driver). My card is a GTX MSI 980Ti 6GB, reference edition, none gaming. Can I update this to the gaming or gaming golden edition 84.00.41.00.3C vBios in order to use the additional voltage sliders properly (as there is not an updated version of my exact card bios available) or will it not be compatible with my card? I notice this vBios is a slightly different size to mine, 194kb vs 224kb. Thankyou in advance for help. No, do not use any of those other than reference; the card will crash or brick due to having different voltage controller etc. If you want the latest 84.00.41 you can use any reference card bios from other brands. btw it does not matter that the file size is different. I wonder if the BIOS is also the reason why my folks' Zotac GTX 1060 Mini 6GB gets the Error 43 with certain drivers. It's the stock BIOS, though. Did Zotac modify it? Thankyou for the help. I thought that might be the case. Good idea regarding flashing another reference bios, I hadn't thought of that. Very useful little thread with some good information, glad to see it has stayed fairly on topic. Thanks again. Will post result once I've had chance to try it. i found this forum on my research and sleepless nights cause of the driver Code 43 failure. I Bought my GPU used with modified Bios i think. It is watercooled and i doesn´t touched it. Im not really familar with GPU Flashing, but would risk it, to get new Drivers for my System. Can you please give me an advise if i understand everything correctly? That looks like a a SC stock cooler. Here's the unmodified bios if that card. Flash it and see if it fixes your issue. And no, your modified version would still not work. Agent-A01 would you mind fixing my bios too? I dont think I have boost clock activated and dont really need it cus I setup +450Mhz on MSI afterburner and it works steady with that. At max could go to 1500Mhz to core but its not very stable on gaming. I dont know could the card go higher, it seems to stop on power limit "Perfcap reason: power"
Be sure to reset AB OC. I raised power limit to 315w default and 356w maxed out which should be more than enough.